Hardening off is the process of adapting plants to the outside, so they can get used to sunlight, wind, rain, cool nights, and less frequent watering and fertilizing. The hardening off period allows your seedling to transition from the comfortable growing conditions under lights or in a warm greenhouse to the normal conditions they will experience in the garden. I like to allow at least a week to harden off seedlings before transplanting to the garden. Depending on the weather, sometimes two weeks are necessary. Be patient and you will be rewarded with healthy and strong plants. 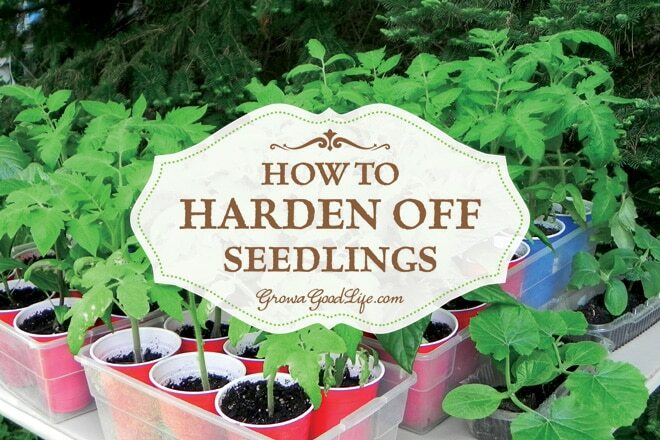 Why Should You Harden Off Seedlings? Sunlight is stronger than grow lights and can burn foliage if the seedlings are placed in the direct sun. Light breezes can sap your plants’ moisture and cause weak stems to break. Cooler nighttime temperatures may stunt the plant’s growth or even kill a seedling that is not used to it. Gradual exposure to the outside elements allows the plants to toughen up and become accustomed to being outside. 1. Begin Hardening Off Your Plants in a Sheltered Location: About a week or two before your transplant date, place your plants outdoors in a protected spot for a few hours on the first day. I like to situate my seedlings on a patio table under an umbrella to shade them from the sun and shelter from rain. The table is located in an area that is also protected from harsh wind. Allow your plants to remain outside for a few hours, then bring your plants back inside. Keep an eye on the weather during the hardening off period. Temperatures can drop to unseasonable levels quickly, and high winds can destroy tender foliage and knock over seedling trays. Watch the weather for early-season frost or unsettled conditions and bring transplants indoors until the weather returns to normal. 2. Increase Outdoor Exposure a Little Each Day: Increase the amount of time that the seedlings spend outside gradually to allow the plants to adjust slowly. Continue to harden off seedlings by moving the plants outside while temperatures are warm and then back inside at night when the temperature is cool. I usually add a couple of hours each day as long as the weather cooperates. Alter the shade or move the seedlings to a location that receives morning or evening sun, so they are exposed to a little more sun each day. Allow the seedlings to experience gentle breezes. Even filtered sunlight and light breezes can deplete your plants’ moisture, so check on them frequently and give them enough water, so they do not wilt. 3. Leave Seedlings Outside Overnight: Eventually, allow your plants to stay in full sun and outside as long as night temperatures do not drop below freezing. If it is going to get below freezing move the plants indoors. Resume the hardening off process once temperatures return to normal conditions. Cool season crops such as broccoli, Brussels sprouts, cabbage, celery, lettuce, onions, parsley, peas, spinach, Swiss chard, and other hardy greens can tolerate low nighttime temperatures of around 45°F once they have had time to adjust. Light frost won’t harm these seedlings after these are hardened off. Warm-season crops such as tomatoes, peppers, eggplants, melons, cucumbers, and some herbs prefer warm nights, at least 60°F. They can’t stand below-freezing temperatures, even after the seedlings are hardened off. So continue to bring indoors if nights remain cool. After your seedlings are hardened off, they are ready to be transplanted into their permanent location in the garden. Prepare your garden bed ahead of time. If the weather has been dry, water the bed thoroughly the day before you plant. Choose a cloudy day with no wind and transplant in the late afternoon or evening to give your plants time to adjust without the additional challenge of the sun. Water the seedlings well after planting. Hardening off is an important step to reduce stress on your plants. If you harden off seedlings properly, they’ll be strong and able to withstand full sun, light breezes, spring rains, and fluctuating temperatures. Once transplanted to the garden, the plant’s energy will be focused on establishing roots and growing rather than surviving. Like to start my precious seeds indoors til ready to go outside by May of mother’s day. Have been successful for a number of years doing it this way. Will harden off to withstand cold and sun per your advice. I never want to transplant seedlings from tiny cells, to bigger cups, to even bigger containers! Right now I am using a larger flat containing 12 individual square cups. I hope this size works out. Does anyone have tips regarding this process? I only have enough room under the grow lights for about 3-4 trays of plants, so getting as many in a flat as possible is best, but I don’t want to continuously transplant – just go from container to garden. Kayray, It is always a challenge to juggle seedlings under lights. There never seems to be enough space. I use soil blocks for most of my seedlings. 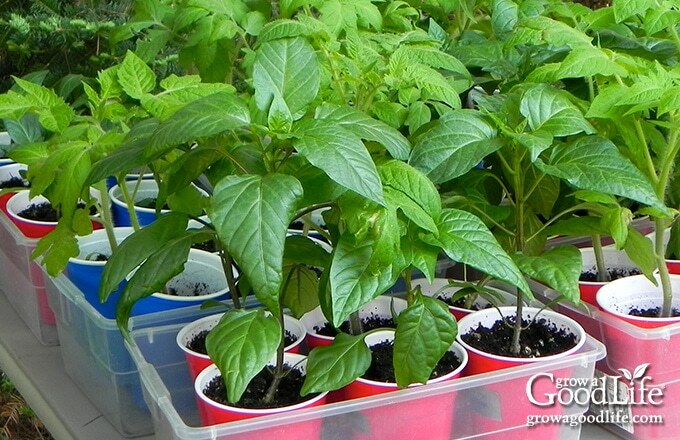 The only plants that are potted up to larger containers are peppers, tomatoes, and eggplant. The rest are hardened off and transplanted into the garden without potting up. Quite interesting and informative details you have mention for those who are interested in growing by themselves….thanx. I learned this lesson well! I plopped my little tomato babies into some full sun with some wind and boy did they NOT love me! Most of them survived, and the sun/wind burned leaves have peeled off, but I’ll sure take things slower next time! Your suggested nighttime low temperatures are laughable to this northern gardener. Most of the cool season crops are perfectly fine with light frosts (although some would still prefer some coverage.) And if we waited until nighttime lows were in the 60’s to plant out our tomatoes, etc…..we’d only have a 10 day growing season here in Montana! We put them out about the time of last frost, and watch them like a hawk if it dips below 40. Thank you for sharing How to Harden Off Seedlings with us at the Healthy Happy Green and Natural Party! I am pinning and sharing! Great tips! I learned the hard way that you can’t just pop them in the ground when you are ready! 🙂 Thank you for sharing this week on the Art of Home-Making Mondays! This is great information, especially for a gardening novice like myself. Thank you so much for sharing this with us over at Merry Monday! We hope you’ll join us again this week! I can’t really grow anything indoors anymore…the cat thinks they’re her toys and steals my starters! Pinned these for the future. Excellent post, Rachel! 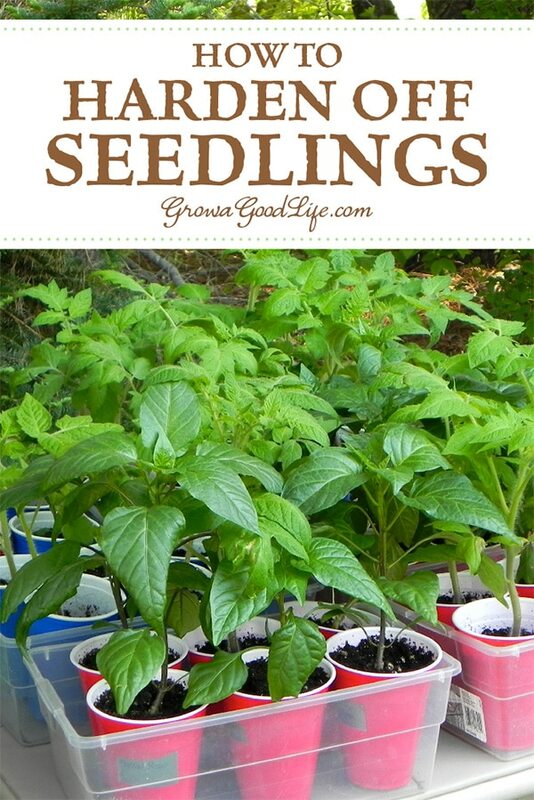 I’ve been looking for a great guide on how to harden off seedlings. I found you on Green Thumb Thursday through Lisa. Looking forward to reading more on your blog! After going back and reading a bunch of your oldest posts I realized we live only a couple towns away from each other 🙂 It’s nice to read another blog from a local so I can kind of compare notes on the growing season! Thank you so much for these tips! I have a 50/50 chance of my seedlings making it, and now I know what to do. Found you on Marvelous Monday Linkups! We have tried to many times to grow seeldings and failed every time. Should try some of your tips! Hardening off is definitely one of my least favourite tasks in the garden. I’m in the process of tweaking my timing and locations to make it as easy as possible. Shuffling the seedlings out every morning and back in every evening is one of my least favorite tasks too. I can’t tell you how many times I have had to go outside late at night because I forgot. Thankfully, they have all survived even when I slip up a little. All true! I’ve had good luck using a small set of “greenhouse” shelves on my deck next to the house. The seedlings have a little more shelter from the plastic cover, and when they look ready, I remove the cover and let them toughen up a little more before transplanting. Important point about shading young seedlings from full sun as you can easily bleach the young leaves and they will die off and potentially kill the plant. Light shade is good and eventually exposing to full light. You could place your plants in a cold frame with a sheet of newspaper draped over also. Thank you. This is excellent information to share with new gardeners. Nothing is more disappointing than to watch your precious seedlings wither if not hardened off properly. Pinned and shared with all.